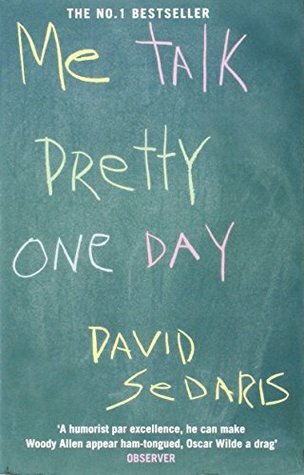 David Sedaris is a Grammy Award-nominated American humorist and radio contributor. Sedaris came to prominence in 1992 when National Public Radio broadcast his essay "SantaLand Diaries." He published his first collection of essays and short stories, Barrel Fever, in 1994. Each of his four subsequent essay collections, Naked (1997), Holidays on Ice (1997), Me Talk Pretty One Day (2000), Dress Your Family in Corduroy and Denim (2004), and When You Are Engulfed in Flames (2008) have become New York Times Best Sellers. As of 2008, his books have collectively sold seven million copies. Much of Sedaris' humor is autobiographical and self-deprecating, and it often concerns his family life, his middle class upbringing in the suburbs of Raleigh, North Carolina, Greek heritage, various jobs, education, drug use, homosexuality, and his life in France with his partner, Hugh Hamrick.